Please contact Elise Fox at elise.fox@srnl.doe.gov or 803-507-8560 if you have any questions. Thank you to those who made it to our Spring Meeting and Solar Champion Awards in April at the State Farmers Market! We had a great turnout to honor our champions who have made a difference in solar in South Carolina and enjoyed the updates from our presenters. Click below on the links to see the power points that were presented. Thank you for attending our annual fall meeting! We had over 100 people from across South Carolina and the southeast! 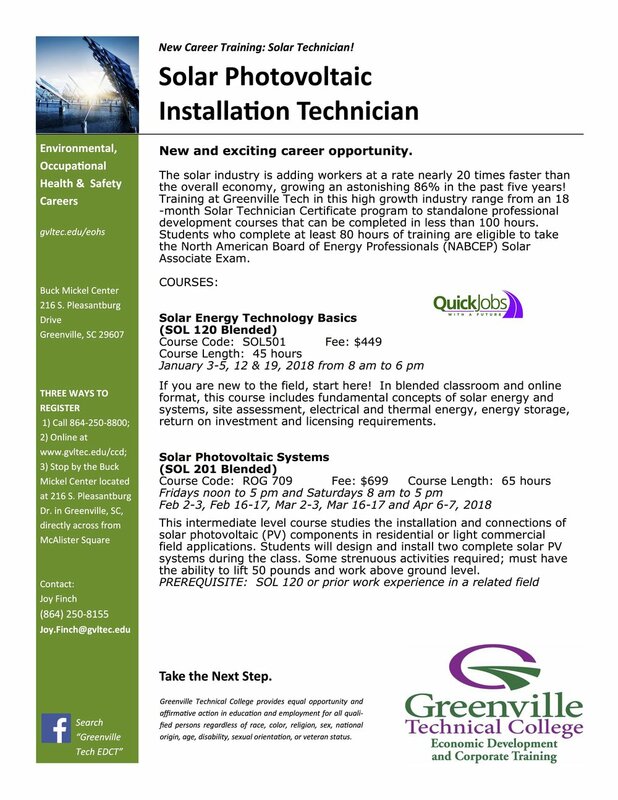 Greenville Tech will be kicking off 2016 with a new series of Solar Technician classes. These can be taken as stand-alone training professional development training courses, or participants can choose to enroll in their Solar Technician Certificate program. The classes listed below are scheduled for early 2016. You can register for the courses by calling 864-250-8800; online at www.gvltec.edu/ccd; or by stopping by the Buck Mickel Center located at 216 S. Pleasantburg Drive, Greevnville, SC (directly across from McAlister Square). Below is information from Leigh Ford's presentation from the SC Solar Council 2015 Fall Meeting. Leigh is with the Office of Regulatory Staff. Since 2009, PaCE has bought REC’s from renewable energy facilities in the state. With the new DER Programs, IOU’s will own the REC’s.